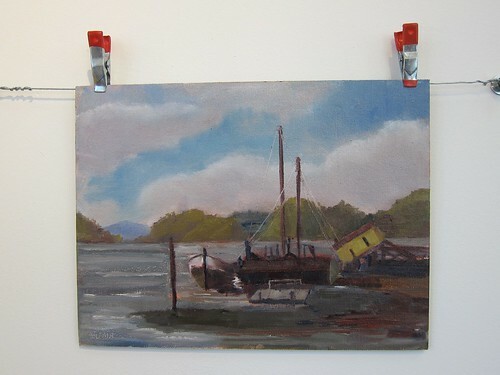 Was excited to take Randy Sexton's workshop "Strait Color," hosted by Arts Benicia, last month. I've been a big fan of his work, plus it was an excuse to explore a new part of the Bay Area. Randy began the class with a demo of a building in Benicia. He asked us to concentrate on simplifying shapes into just two values, to start. Painting outdoors, he noted, is like a shorthand language -- it's important to step back and see what works from a distance. After his demo, we chose locations around the Benicia waterfront to set up and paint. I decided to try a challenging scene of boats and cranes, with Winsor & Newton Artisan Water Mixable Oils. This was my first time using them for plein air painting. My Strada easel held up well, though the gusty winds meant I had to clamp or secure everything very carefully. My verdict? I think I could have brightened my colors a bit. I'm happy with the blending on the clouds, which incidentally chased the sun all afternoon and made it difficult to figure out light and shadow. I'm fairly happy with the result, especially the composition. 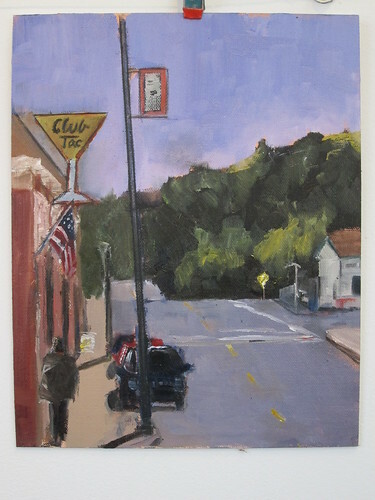 The only part I couldn't do on location was the lettering on the sign; I ended up doing that with an oil-based pencil later when I touched up the painting in the studio. Oddly I find oils/acrylics difficult to paint with outdoors -- they are much more forgiving than watercolors, but it means I have to think backward. With watercolor I think about which parts of the page I need to leave blank, but with oils the darks generally go on first. I'll just have to keep on practicing with both! I love your energy and your work, too! What a great boost of energy your blog gave me this morning! 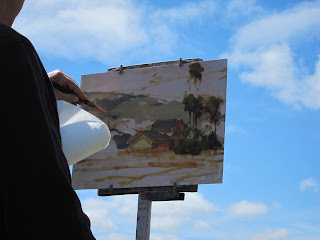 Well done on those plein air paintings, Suma... you are indefatigable ;D.
Looks like a good workshop! I don't think I would be happy going back and forth since the thinking process is so different.